In this blog entry I'll go through the process of developing a DataCleaner extension: The Groovy DataCleaner extension (just published today). The source code for the extension is available on GitHub if you wish to check it out or even fork and improve it! Second step: Build a quick prototype. This usually starts by identifying which type of component(s) you want to create. In my case it was a transformer, but in some cases it might be an analyzer. The choice between these are essentially: Does your extension pre-process or transform the data in a way that it should become a part of a flow of operations? Then it's a Transformer. Or is it something that will consume the records (potentially after being pre-processed) and generate some kind of analysis result or write the records somewhere? Then it's a Analyzer. The API for DataCleaner was designed to be very easy to use. The ideom has been: 1) The obligatory functionality is provided in the interface that you implement. 2) The user-configured parts are injected using the @Configured annotation. 3) The optional parts can be injected if you need them. In other words, this is very much inspired by the idea of Convention-over-Configuration. Great - this verifies that our Transformer is actually working. 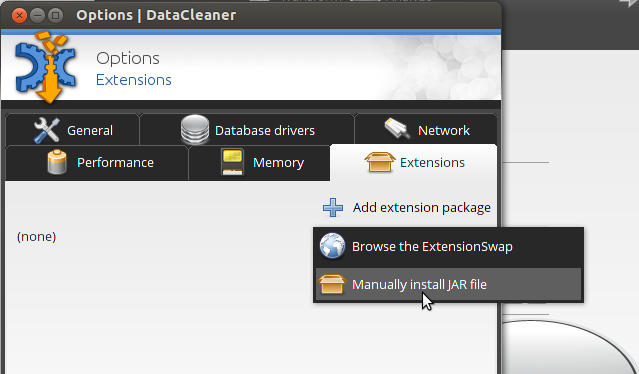 After registering your extension you will be able to find it in DataCleaner's Transformation menu (or if you built an Analyzer, in the Analyze menu). My transformer had only a default icon Icons can be defined by providing PNG icon (32x32 pixels) with the same name as the transformer class, in the JAR file. In my case the transformer class was GroovySimpleTransformer.java, so I made an icon available at GroovySimpleTransformer.png. The compilation of the Groovy class was done when the first record hits the transformer, but ideally we would want to do it before the batch even begins. This point is actually quite important, also to avoid race-conditions in concurrent code and other nasty scenarios. Additionally it will help DataCleaner validation the configuration before actually kicking off a the batch job. After execution it would be good to clean up resources used by Groovy. Similarly to the @Initialize annotation, I can also create one or more descruction methods, annotated with @Close. In the case of the Groovy transformer, there are some classloader-related items that can be cleared after execution this way. Side-note - Users of Hadoop might recognize the OutputRowCollector as similar to mappers in Map-Reduce. Transformers, like mappers, are in deed quite capable of executing in parallel. Fifth step: When you're satisfied with the extension, Publish it on the ExtensionSwap. Simply click the "Register extension" button and follow the instructions on the form. Your extension will now be available to everyone and make others in the community happy! I hope you found this blog useful as a way to get into DataCleaner extension development. I would be interested in any kind of comment regarding the extension mechanism in DataCleaner - please speak up and let me know what you think! Wow, thank you for such a good tutorial. It's often so hard to find what ou need, but your blog is a true treasure for every one who is fond of programming. So much interesting information. now I don't need to purchase my homework. Though WritemyPapers.org discounts are very delightful.